Hi! I'm Supasorn or Aek. I'm now a lecturer at VISTEC, a new research institute in Rayong, Thailand with a really nice, foresty campus. I'm looking for students, RAs/interns, postdocs, and all sorts of collaborators. Shoot me an email if you're interested. Also for PhD, please apply directly here. Earlier I was a research resident at Google Brain working on geometric understanding in deep learning, with the side-hope of solving image synthesis. I finished my Ph.D. from UW working with Prof. Steve Seitz and Prof. Ira Kemelmacher in Graphics-Vision group GRAIL My goal is to bring computer vision out of the lab into the real world and make it really work in the wild. My thesis tries to answer: Can you create a computer model of anyone that looks, talks, and acts just like them by analyizing their existing photos and videos? 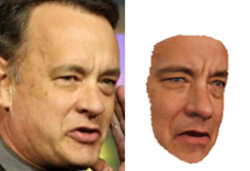 In particular, I developed a set of algorithms that can generate a "moving" 3D face model out of just photos, synthesize high-quality facial textures with dynamic creases and wrinkles, capture and transfer facial expressions, and generate videos of a person from their voice, and more. 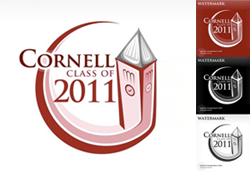 I went to Cornell for undergrad, and had a great pleasure working with Prof. John Hopcroft on social graph algorithms, and later got inspired by Prof. Noah Snavely with his computer vision class. 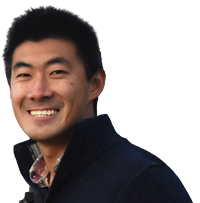 I love hacking, coding, tackling hard problems, and I tried very hard to make my solutions as simple as possible. My first name at gmail. If I don't reply, feel free to ping me. It's likely I lost it in the pile of 30K+ mails. 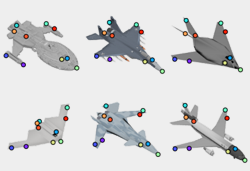 We present KeypointNet, an end-to-end geometric reasoning framework to learn an optimal set of 3D keypoints, along with their detectors. 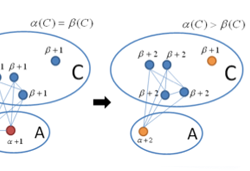 Our model discovers semantically consistent keypoints across viewing angles and object instances and outperforms a fully supervised baseline on the task of pose estimation -- all without keypoint location supervision. 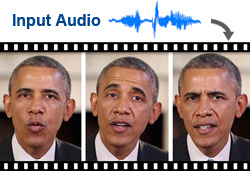 Given audio of President Barack Obama, we synthesize photorealistic video of him speaking with accurate lip sync. 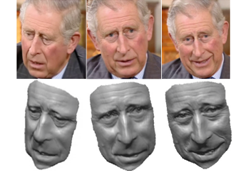 Trained on many hours of just video footage from whitehouse.gov, our recurrent neural net approach synthesizes mouth shape and texture from audio, which are composited into a reference video. We reconstruct a controllable model of a person from a large photo collection that captures his or her persona, i.e., physical appearance and behavior. Our system is based on a novel combination of 3D face reconstruction, tracking, alignment, and multi-texture modeling, applied to the puppeteering problem. 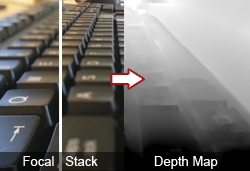 We introduce the first depth from focus (DfF) method capable of handling images from mobile phones and other hand-held cameras. With this technique, we can automatically generate a depth map for every photo you take with your phone. Our approach takes a single video of a person's face and reconstructs a high detail 3D shape for each video frame. We target videos taken under uncontrolled and uncalibrated imaging conditions. 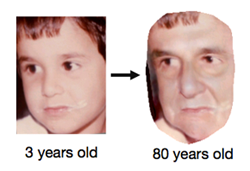 We present an approach that takes a single photograph of a child as input and automatically produces a series of age-progressed outputs between 1 and 80 years of age, accounting for pose, expression, and illumination. 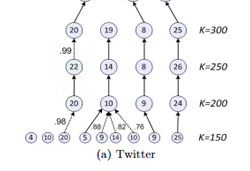 We present a heuristic algorithm that in practice finds a fundamental community structure and demonstrate that the core structure in social networks is due to underlying social structure rather than high-degree vertices or degree distribution. A talk I gave on my algorithm used in the paper (not in WAW). Since 2017 I'm serving as a member of the Global AI Council, AI Foundation, a San Francisco-based company focusing on applications and platforms enabled by personal AI. 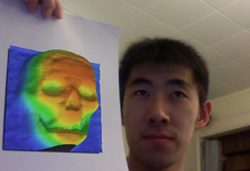 I spent a wonderful summer working with Michael Rubenstein, Ce Liu, image/video/motion analysis experts, at Google Cambridge/MIT on motion-based 3D reconstruction, and received tremendous help and input from the team with Bill Freeman, Dilip Krishnan, and Inbar Mosseri. I lingered around Seattle in 2013 and worked with Carlos Hernandez, a 3D-vision expert, and Steve Seitz, my academic advisor, at Google Seattle in Fremont on uncalibrated depth from focus and eventually published a paper two years later. In 2010 during undergrad, I interned with Harish Venkataramani as a software engineering intern at Google Mountain View on a project related to Gmail and Google+. I built a website for NY beginning farmer project under the College of Agriculture and Life Sciences and implemented a questionnaire app that helps guide farmers to the help they need. My work consists of multiple large components with ten of thousands lines of code, so this will take time and I may not be able to provide support. The "research-code" is neither polished nor properly commented, but I decided to release it now for research and educational purposes. No commercial use allowed. Here's the network training code that takes as input processed MFCC coefficients and outputs mouth fiducial points represented as PCA coefficients. My other interests include: photography, 3D printing, product design, graphics design, software dev, startup, sitting in a hammock, getting lost for fun. I play badminton and squash and sports that involve gliding and wheels such as skiing, snowboarding, skating. I flew off my bike a few times and enjoyed numerous wipe-outs from surfing, but still survived. 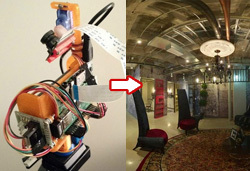 I love hacking and building things and here are some of things I built. 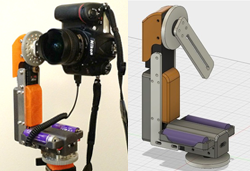 An automatic DSLR rig for capturing 2D/3D 360 photosphere and dense light field for VR. The rig is controlled with Wemos D1 Mini (ESP8266). It has a joystick and OLED screen for displaying menu. The structure is aluminum and 3D printed parts, designed in Fusion 360. Software and hardware are open-source. A prototype camera that automatically captures a 360 x 180 photosphere similar to Google Street View with resolution up to 100M pixel. It's a low-cost version ~$70 of gigapan made from a Raspberry Pi + custom 3D printed case. The camera rotates around the no-parallax point and is remotely controlled from a smartphone through a dedicated WiFi. 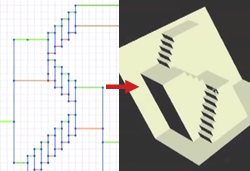 An application that lets you design a 2D pattern that can be automatically turned into a 3D foldable Origami popup model. 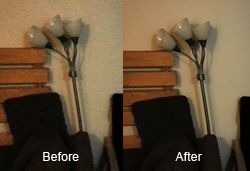 A mobile app which combines multiple noisy shots taken hand-held into a single low-noise photo. What makes it special is that you can throw your tripod away and take pictures with your shaky hand and it will work just fine. 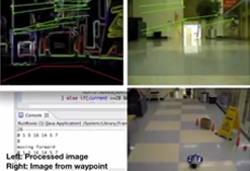 Our goal is to make Rovio a totally autonomous robot which can follow waypoints only based on image and reach the goal position while learning and avoiding obstacles on its way. 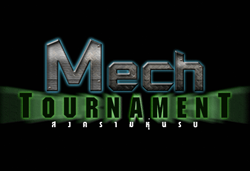 A 2D multiplayer shooting game based on DirectX 8 and DirectPlay. You get to choose your own robot and enter a battle against other players over a LAN network or against computers with challenging AI. An application for controlling and monitoring a computer classroom. The teacher will have the ability to inspect students' screens or any running applications, limit internet or application access, issue online quizzes or polls on any machines in the classroom. 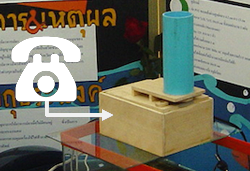 In grade 9, I built a remote fish feeding device that is connected to a home telephone line. The device can then be activated by calling home from anywhere and press a secret passcode. Fish will thank you while you're sunbathing on a beach. 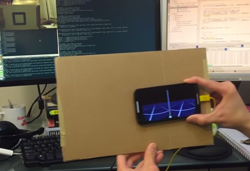 I'm trying to add positional tracking to Cardboard App (Full 6DOF). Proper calibration is needed. Tracking is done on computer and position values are sent through USB to the phone (TCP via ADB). Latency is not superb, but should be better than using phone's camera and phone's processing power. Our fun app that can plot a 3D graph on a piece of paper. During the contest, some number of kids had a lot of fun hand-drawing 2D patterns e.g. hearts, their names, random arts and visualizing 3D surface in real-time. 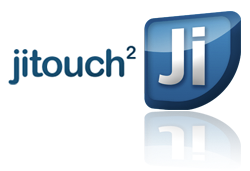 An awarding-winning Mac app that expands the set of multi-touch gestures for trackpad, Magic Mouse for frequent tasks such as changing tabs in web browser, closing windows. It also recognizes handwritten alphabets as input gestures. 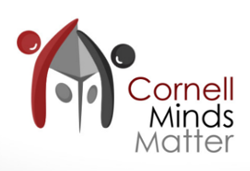 Please check it out! 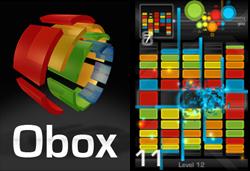 A fast-paced puzzle game on iPhone that I made over one summer during an internship (not related). Unfortunately, it's no longer available and I did not have time to update for newer iOS. 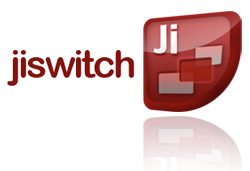 jiswitch is a free Mac application that introduces a new way to switch applications. In a nutshell, it allows users to assign any window a name, and later bring that window to the top whenever the same name is typed. 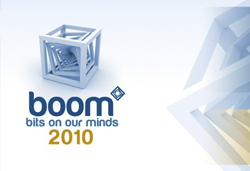 This tool is meant for power-users or coders who have many windows opened. 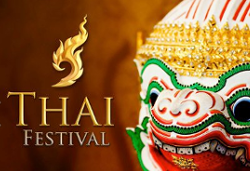 A poster for Cornell Thai Festival 2010. It contains my hand-drawn Thai ancient art called "Lie Kranok" as seen above the text. 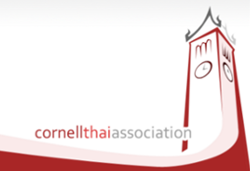 A logo for Cornell Thai Association. It's the clock tower with a new twist on the roof.